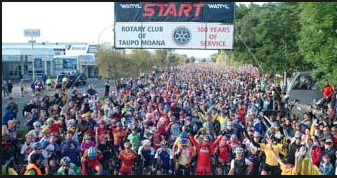 Are you interested in participating in the Taupo Cycle Challenge on 29 November? What to eat / drink. (On and off the bike). What to wear for rides. How to change a tyre. When to do your biggest ride(s). How to ride in a group. How to train. (And When to train!!). And generally ‘Where to start’. Being unsure of how to map out an event such as ‘Taupo’ is one of the biggest reasons why people start training yet never make the event’s start line. Your time is precious. Train smart, enjoy the journey of getting fit for Taupo, and then cherish the experience of cycling around the Great Lake. Information about bike safety and group etiquette. Entry to a weekly group – I’ll look after you on the rides. (Paraparaumu area). Email updates about the weekly circuit being cycled, with hints and tips included. A personalised training program that fits in with your commitments. Feedback on your daily nutrition. (Via the web). Email contact (if needed) for asking me questions about the training. Helpful advice about overcoming race day (and training day) nerves. Information on stretching. (‘Yes’ - It will help your cycling). Additional mileage before the Sunday group rides - I will be on rides. Race day advice and assistance with planning your gear for the big day. (Touch base to discuss the extra assistance - I have been doing training programs for cyclists for the last five years - This is my fulltime occupation, so you are in safe hands). Gaining the New Zealand 24 hour (outdoor) track record in 2012. Completing cycling events such as the 320km Taupo ‘Enduro’, 640km Taupo ‘Maxi Enduro’, and 505km Graperide ‘Ultimate’. Completing other sporting events, such as the Ironman, Half Ironman, the 5km Taupo ‘Epic’ (swim), swimming the 7.6km length of Lake Rotoiti, and multiple marathons. Gaining a BA in Psychology (Victoria University), and training in Neuro Linguistic Programming (NLP - ‘Advanced Business Communication’). Qualified Personal Trainer, with a Diploma in 'Fitness and Nutrition'. (Based at Kapiti City Fitness). The group is endorsed by the Kapiti Cycling Club. I look forward to hearing about your goals.